Pink and Green–Top enamel is a dusty rose and the bottom is olivine green. Finished in burnished bronze. Lilac and Blue–The egg is layered in gleaming silver plate. Top enamel is pale violet. The bottom is azure blue. 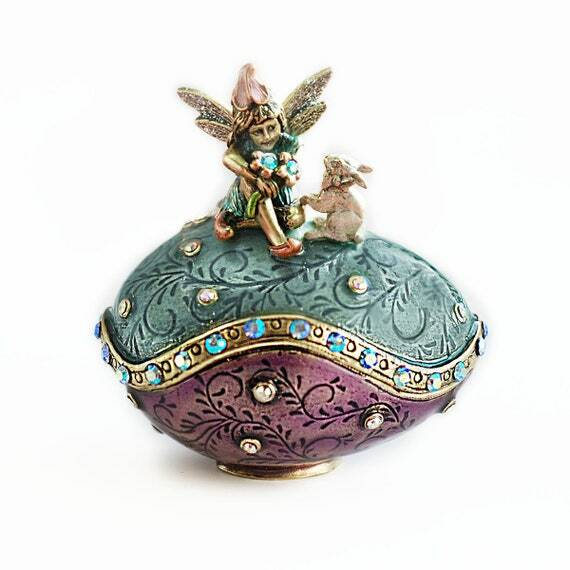 In the realm of small treasures and sweet dreams, there is an egg box home to a tiny fairy and her rabbit. The egg is engraved with a Florentine vine and colored with translucent enamel in shades of aqua and plum. Atop the egg, the fairy sits, with a sepal hat, pointy-toed slippers and gossamer wings. She shares tender regards with her bunny friend. The box opens along a serpentine curve, is finished in burnished bronze and accented with Swarovksi aurora crystal. A treasure that transmits joy every time you look at it. The perfect gift for someone very special to you. 1-3/4″ L x 2″ H Designed and made in our Los Angeles studio. 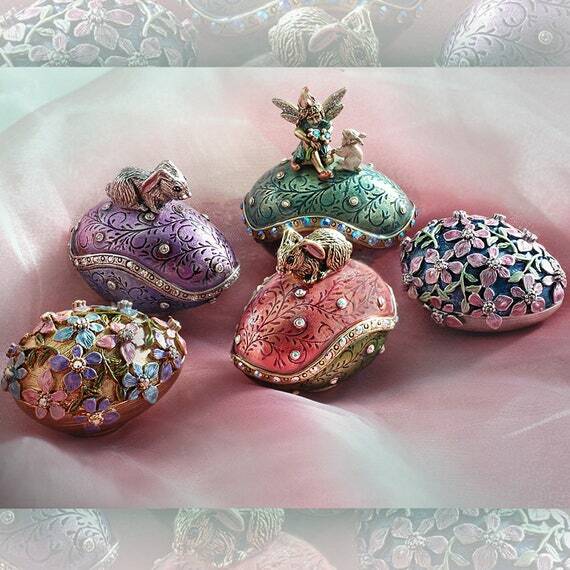 This miniature egg box features our exquisite signature sculptural detail. It is engraved with a Florentine vine and colored with translucent enamels. 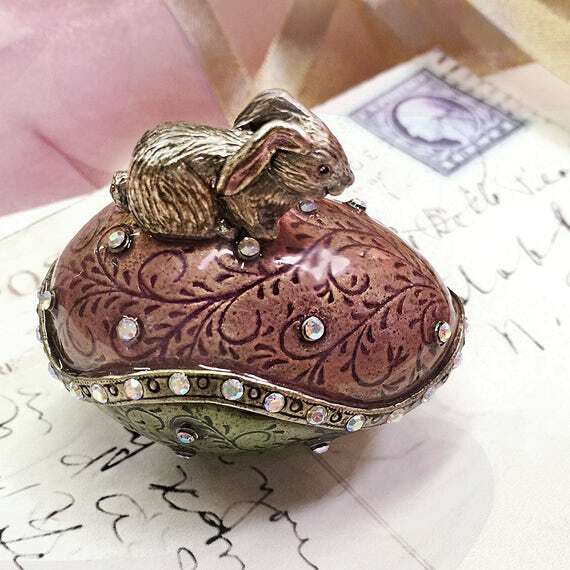 The box opens along a serpentine curve, lined with Swarovksi aurora crystal and topped with our miniature rabbit. 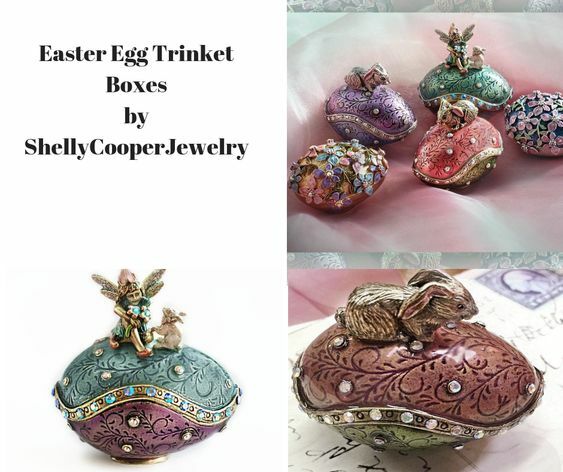 Every year, this little box will be treasured at Easter, but you’ll want to enjoy the feeling you get looking at it all year long. Could there be a more perfect gift? 1-3/4″ L x 1-3/4″ H Designed and made in our Los Angeles studio. –LB Lilac and Blue The egg is layers in gleaming silver plate. Top enamel is pale violet. The bottom is azure blue. Last photo shows all the eggs in our collection. Search ‘egg’ in my shop to see each one.